Future plans... 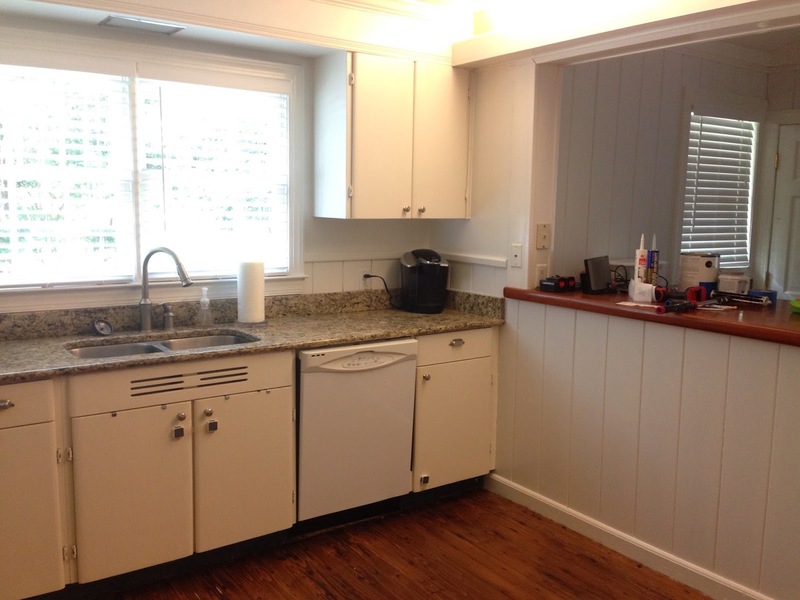 I'd like to remove the wall separating the kitchen from the dining room (wall is to the left of this picture). 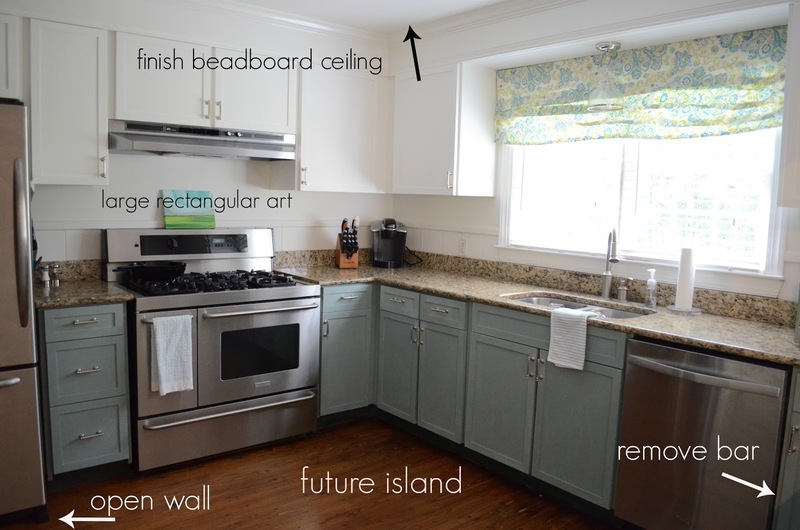 I'd also like to remove the high bar that separates the family room from the kitchen. I just think a larger open space would do great things for the traffic flow in this area. We never use the bar, and it's a constant catch-all for clutter, which I cannot stand. I'd also like to add a small workspace style island on wheels that also has storage cabinets and drawers. 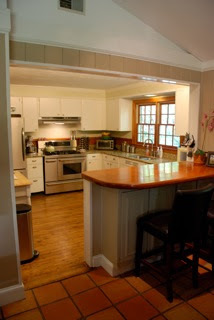 I'd like to finish the beadboard on entire ceiling and add recessed lighting. Lighting is EVERYTHING in your home. It can seriously make or break a room. Right now we have an old light in the bulkhead and the new pendant over the sink. Recessed lighting would go a long way in here. Maybe eventually we will replace the granite, but that's not really high on the priority list at this point. It's in good shape so we'll roll with it. I have some accessorizing and organizing yet to do, but I'm glad the paint is finally done! One more thing off my to-do list. I love the kitchen...if feels so cool and fresh! 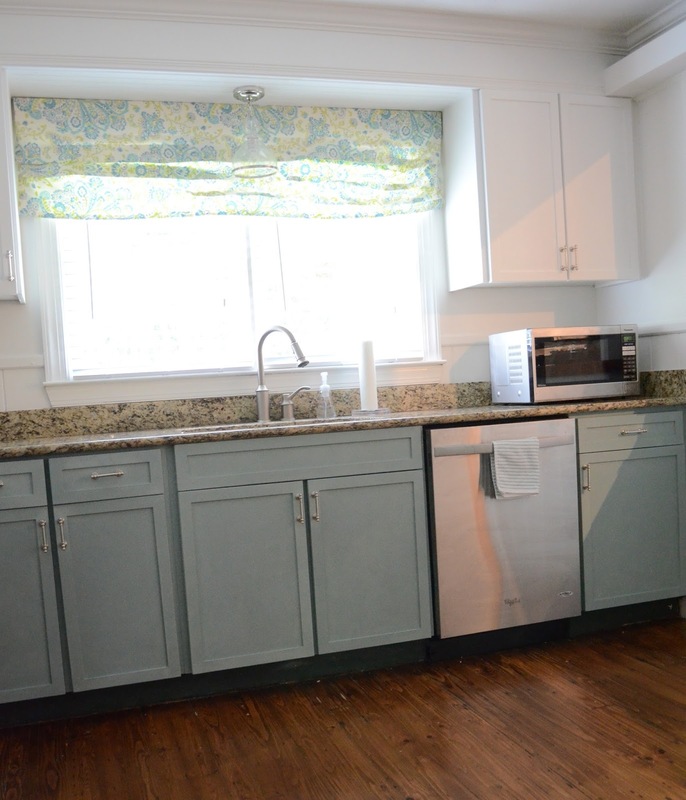 Would you mind sharing your paint color on the lower cabinets? Would love it in my guest bedroom! It is Annie Sloan Duck Egg Blue!